In 1834, the first female Chinese immigrant, 14-year-old Afong Moy, was sold by her father to the Carne brothers, American traders in Chinese goods, in order to “perform” on Broadway for the public for 25 cents a head. Here, in her room, she walks (teeters) on her 4 inch long bound feet, eats with chopsticks and recites in Chinese. She doesn’t understand English and her audiences don’t understand Chinese. She is purely an exotic object to be gawked at in the same manner that “Siamese twins,” or contortionists were displayed at sideshows, by people like P.T. Barnum, who eventually brought Afong Moy into his shows. 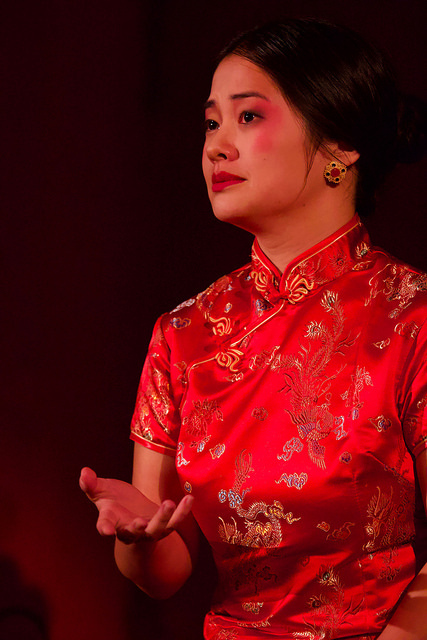 Lloyd Suh’s play, telling Afong Moy’s true story, was commissioned by Ma-Yi Theater Company and is performed at the BSC’s smaller St. Germain Stage, a perfect venue for this intimate, two person production. In addition to Afung Moy, wonderfully played by Shannon Tyo, the other character in the show is Atung, her translator, played by Daniel K. Isaac. Atung is the funny, sometimes ironic counter weight to Afong Moy’s sweet sincerity. Sadly, Mr. Isaac displays the bowing, nodding and smiling that are so familiar as mischaracterizations of Asian immigrants. Afong’s encounter with President Andrew Jackson provides us with a window into the discrepancy between what is actually being said, and how Atung chooses to translate the conversation. Through Suh’s brilliant contrivance, we understand both the original Chinese words (spoken in English) and Atung’s translation to the President. Afong’s sophisticated, nuanced Chinese response is reduced to simplistic, pidgin English. Given our current delicate international negotiations this scene becomes all the more relevant and timely! A shocking moment of Jackson’s startling lack of sensitivity is illustrated when he asks to see and feel Afong’s bound feet, considered to be an intimate and deeply private part of a Chinese woman’s body. As the story progresses, Afong Moy (and the audience) becomes more and more aware of and incensed by, the waves of Chinese immigrants to this country throughout the 19th century, and how they were excluded from becoming citizens even as they were building the railroads; a history that is not generally well known or taught in school. This play takes place in one room, Atong’s home from age 14 on into her 70’s. The atmospheric music, costuming, lighting, and use of one huge curtain provide us with the sense of time passing. It is a fascinating piece of theater and history, beautifully and bravely told.